Have you heard? 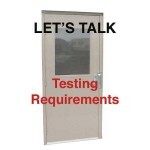 There have been some important changes to walk door testing requirements upon which the latest commercial energy codes are based. This post aims to give you a quick breakdown of the key update we think is most important for builders to know.